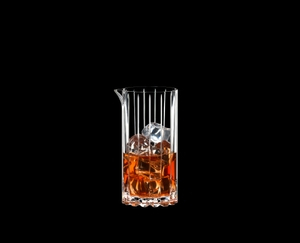 The innovative machine-made Mixing Glass of the functional glass collection RIEDEL Drink Specific Glassware is used to prepare the cocktails before they are poured into the appropriate glass. The integrated measure (90ml) makes it easier to achieve the perfect mix. Each unique glass in the RIEDEL BAR DRINK SPECIFIC GLASSWARE collection is crafted in Riedel’s familyowned factories. All RIEDEL glasses are dishwasher safe.